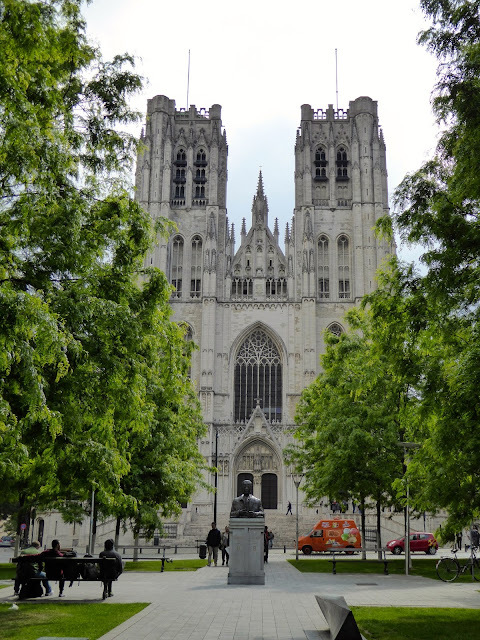 Monday was a nice day in Brussels, although it was another pokey one for us. We lounged around until about 11, then walked just a few blocks to visit St. Michael's Church. Our timing wasn't the best as there was a service. We didn't walk around or take any pictures, but we did make a brief visit to the crypt area, which dates to the 1200's, and was excavated in 1998. 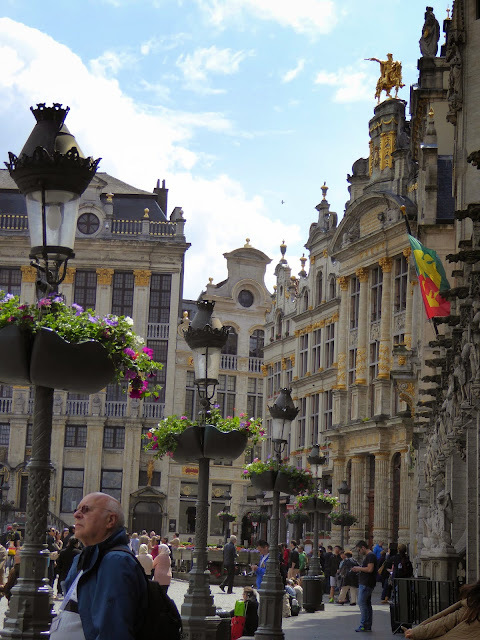 We walked back over to the pretty main square (The Grand Place), hoping there were fewer people than yesterday. We were in luck--still lots of visitors but nothing like yesterday! 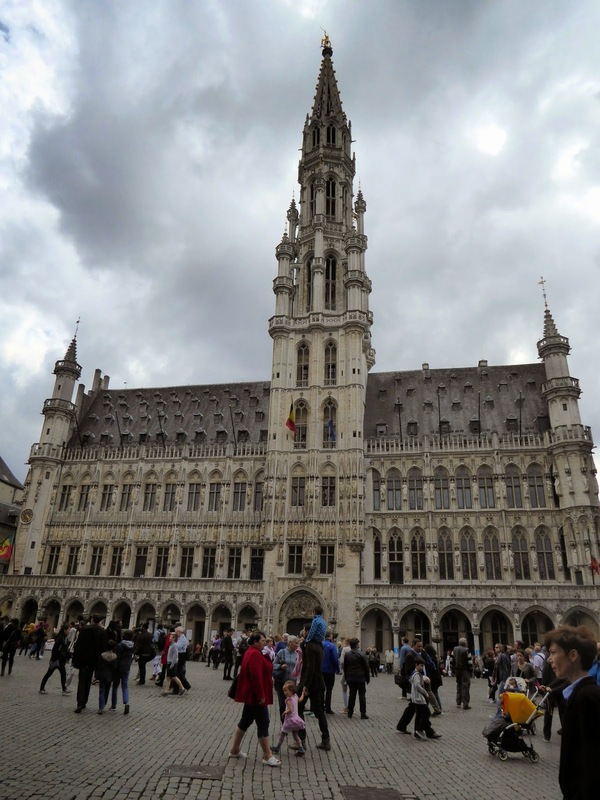 This square is one of the prettiest we've ever seen, there are beautiful buildings on every side. 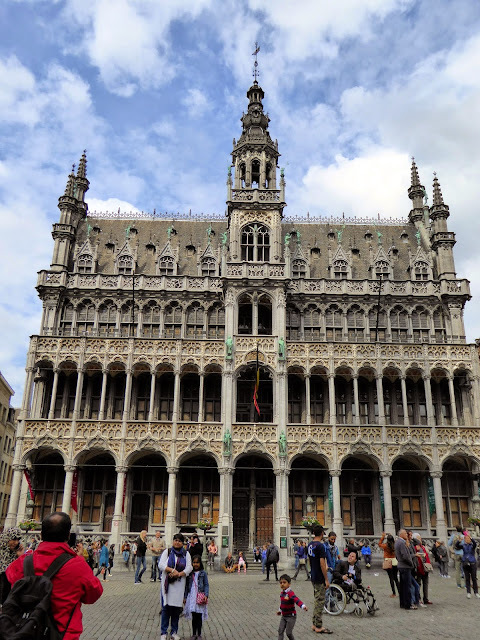 This gorgeous building is the city hall, and there's also a tourist information office right in front. It's open to visit Wednesday afternoons--we'll be there! Several of these buildings are guild halls dating to the late 1600's. One entire side of the square is undergoing restoration, but they have put up a safety barrier/wall with photos of the buildings--pretty nice to at least have some idea of what they look like. There are hundreds of chocolate shops--oh my! I'm not even a chocolate fan, and I really like Belgian chocolate--seriously good stuff. We wanted to visit a certain pub, one that is owned by one of our favorite Belgian brewers, Delirium. We found it without too much backtracking, and actually it wasn't too crowded. It's a huge pub, with lots of different levels and bars, and we found a nice little table for two. David bellied up to the bar and came back with a couple of delicious brews. We met a nice young couple from London, Sitar & Samantha. They were delightful, and we really enjoyed visiting with them--for almost 2 hours. They're kind of "beer freaks" like we are, so it was fun comparing tasting notes. They assured us the "beer scene" has improved greatly in London since our visit in 2008--we just might have to plan a return visit! After our fun visit with Sitar and Samantha, it was 3 pm and definitely time for lunch. Since it was so late we decided we'd have a nice lunch and skip dinner. 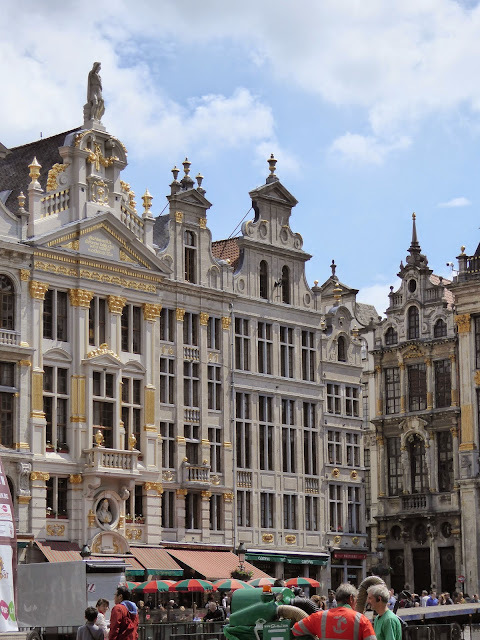 On our list of "must visits" in Brussels was the original "Leon de Bruxelles" restaurant, which opened in Brussels in 1864. Leon's is our favorite restaurant in Paris for mussels, and always our "first night in Paris" dinner choice. 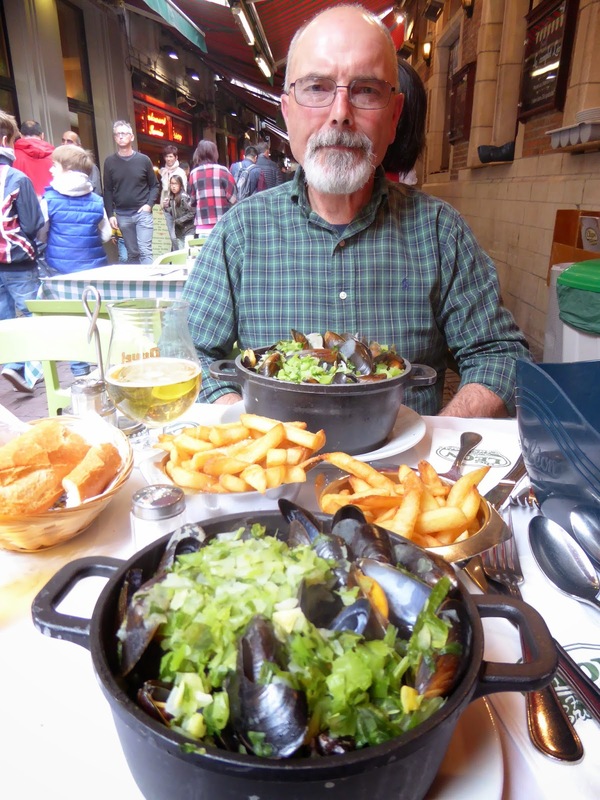 We confess to being a little hesitant after our not so good mussels in Bruges, but Leon's mussels were wonderful, as usual. We enjoyed every bite! Even though it had been a short day, we decided it was time to head back to the hotel and rest my knee, as it was getting quite uncomfortable to walk. We made a quick stop for a couple of beers to chill for later, and soon we were all comfy in our room. No dinner out tonight, but we did enjoy a late night snack--a delicious cheese board and glass of wine from our hotel restaurant. Good night from lovely Brussels!